On this date in 1979, just days after a referendum overwhelmingly voted revolutionary Iran an Islamic Republic, its former Prime Minister was convicted by a drumhead tribunal in Qasr Prison. Minutes after the trial closed, he was shot to death in a prison courtyard. 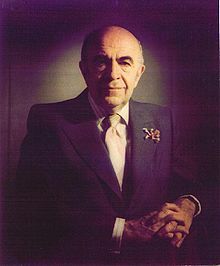 The western-educated Amir-Abbas Hoveyda (or Hoveida) shimmied up the diplomatic ranks in the 1940s and 1950s, and became Prime Minister after Hassa Ali Mansur was assassinated in 1965. Hoveyda held the office for twelve and a half years, longer than anyone in modern Iranian history. He had been noted as a progressive young statesman interested in reforming Iran. But his years in government notably failed to restrain Iran’s endemic corruption and state violence. That he was a debonair polyglot with a discerning taste in whisky cut more ice with his foreign admirers than his future judges. Not long after the economic crisis of the 1970s forced him from office, the Iranian Revolution collapsed the entire state to which he devoted his public service. Embracing either martyrdom or naivete, Hoveyda turned himself into the authorities of newborn revolutionary Iran, and soon found his name on the marquee for a spate of revolutionary trials. From mid-February, every day or two would bring fresh headlines of six or eight or 11 more shot for complicity in the ancien regime. Away from the capital, others suffered the same fate, mostly hidden from the world. Revolutionary Iran’s first Prime Minister, Mehdi Bazargan — a raving bleeding heart by the yardstick of what was to come — forced a halt to the bloodbath by threatening to resign and denouncing the trials as “irreligious, inhuman and a disgrace” on national television. Revolutionary tribunals suspended on March 16, interrupting Hoveida’s prosecution — or merely protracting his death rattle. But Bazargan had less weight to throw around than he might have thought. He would accede himself unhappily to the resumption of the revolutionary courts in early April, and eventually resign late in 1979 over the U.S. embassy hostage-taking. Unimpeded now, those courts stayed busy with near wall-to-wall prosecutions of hundreds of former officials of the hated Shah. It was, indeed, technically that same day — around 1 a.m., following a marathon 15-hour court session — that a half-dozen former military men met the same fate in Qasr Prison. Gen. Iraj Amini-Afshar, Gen. Mohammed-Javad Molavi Taleghani, Col. Mashallah Iftikhar Manish, Col. Hadi Gholestani, Lt. Bhadour Bahadouri, and a rank-and-file soldier named Mustafa Sadri were all shot for having fired on revolutionary crowds in Isfahan the previous December. After a good night’s sleep, they were ready to have done with Hoveyda. * I’m skeptical of the anecdote in Khalkhali’s current Wikipedia page that the judge shot Hoveyda to pre-empt a possible stay. Virtually all the pre-execution 1979 reporting I’ve seen agreed that Hoveyda had no prospect of clemency given the political situation, and that the end of the Bazargan moratorium and resumption of the trials was tantamount to his death sentence. Weeks later, in Evin prison, he discoursed again on the finer details of stoning to death. I still have the cassette of our conversation, his lips smacking audibly on a tub of vanilla ice cream as he spoke.